I love these enchiladas. They are so amazing. I was excited to make them again the other day because I know how much Derek likes them. He was supposed to come home from school at 5 pm so right at 5 it was ready and I had the table set and I waited and waited and waited and he didn’t come home. So I checked my Google calendar- we each have a calendar we share- and I saw he actually wouldn’t be home until 7 pm. I was bummed. When he left school he texted me he was coming home so Levi and I went outside to meet him. When he came up to me he hugged me and told me that HE GOT A JOB! He had just received the call a few minutes ago. I was SO HAPPY! And it’s the job he wanted. He graduates from college in 2 weeks and we were worried about not having a job then. We are so grateful! Then we came up and ate these amazing enchiladas and celebrated. It turned out to be a great night! I found this recipe from the amazing Pioneer Woman. When I first came across her blog I was so excited about it I went through all her recipes and book marked the ones I wanted to try. 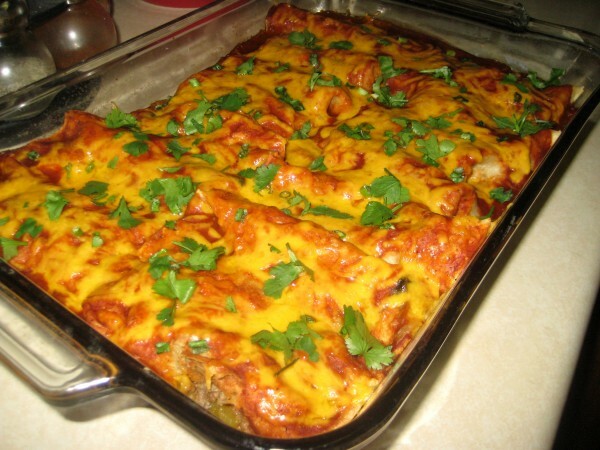 One of those recipes were these enchiladas. I was SO excited to try these! The first time I made these I followed her recipe exactly (except for adding olives…) I was not disappointed. I couldn’t believe how good they were. But I didn’t like how time consuming it was and it involved frying. I have changed a few things about the recipe so it is less time consuming and healthier. I even did an experiment, I made these enchiladas and fried half of the tortillas then baked the other half and with out telling Derek the difference I had him try both and tell me which one he liked better. He said the baked onces were way better. So there you go! Healthy can be great. I hope you try these because I promise you will love it! In a large saucepan over medium heat, add oil and flour and whisk together to make a paste, cooking for one minute. Pour in the enchilada sauce, chicken broth, cilantro, salt and pepper. Bring to a boil. Reduce heat and simmer 30-45 minutes. *Preheat oven to 400 degrees. Brown the meat with onions in a skillet. Drain off fat. Stir in the can of diced green chilies, some chopped green onions and seasoned salt. Set aside. Place tortillas, 6 at a time on a cookie sheet. Spray lightly with non-stick cooking spray, lightly sprinkle salt on top. Place in oven for a few minutes, or until slightly crisp but not too crisp to fold. Repeat until all tortillas are done. Lower oven temperature to 350 degrees. Pour ½ cup red sauce in bottom of baking pan. Spread to even out. Spoon meat onto the middle on the tortillas. Roll up and place, seam down, in baking pan. Repeat until pan is filled. Pour extra enchilada sauce over enchiladas. Top with cheddar cheese.Bake for 20 minutes or until bubbly. Sprinkle cilantro and chopped green onions over enchiladas before serving.